From extreme closeups of individual grains of sand to intimate surveys of scarred flesh, Hiroshi Teshigahara's “Woman In The Dunes” (1964) is a film of closely-observed textures. The sinuously shifting dunes of the title ripple across the entire screen; later the stubble on a man's chin will fill the frame in a similar repeating pattern. It comes as little surprise to learn that Teshigahara was trained as a painter and a potter. Cuts that link landscape to bodies emphasize the status of both as sculpted objects, objects to be shaped and controlled, before the story even kicks into gear to underscore the impression. A man (Eiji Okada, of “Hiroshima Mon Amour” fame) trudges through a coastal desert in rural Japan, seeking his own objects to collect. He's in hot pursuit of exotic insects, namely a tiger beetle whose discovery could help make him famous, if only in the smallest way, but in a bigger way than he can currently claim as a teacher in Tokyo. He stops at the brink of a sandy pit and is shocked to discover a ramshackle hut at the bottom. He casually snaps a picture as a local villager inquires about his business in the area. Relieved to discover that the man is not a government inspector, the villager kindly offers him a place to stay for the evening. Our man is only mildly surprised when said offer involves descending a rope ladder into the pit where he shares dinner with the woman (Kyoko Kishida) who lives there alone. The viewer, having heard the jangling, dissonant music by Toru Takemitsu, is already suspicious. By the time our man innocently reminds the increasingly friendly woman that he is “only staying for the night” it doesn't take much guesswork to sense trouble looming. By the next morning, the amateur entomologist realizes he is the latest specimen collected by the locals, and soon learns he has been downgraded from teacher to “helper” to the woman whose job is to shovel sand for the villagers to sell to shady construction firms. He resists as long as he can, but his captors hold all the cards, as well as all the water. The woman is happy to have company and is genuinely puzzled by the man's desperate efforts to cling to this strange concept called free will. She shovels sand. That's her job and this is her home. What else would she do? Without the sand, nobody would pay even a modicum of attention to her. Sand dominates their world. Sand tumbles down the edges of the pit and piles up so quickly every night they must shovel just to keep the hut from being swallowed whole. Sand eats through the wood. Sand contaminates the food, the water. Sand scrapes flesh raw, and if the man ever escapes the sand pit all he has to look forward to is running across miles and miles of sand. And so they shovel sand so they can live another day to shovel sand. If you're thinking about the myth of Sisyphus so was writer Kobo Abe whose avant-garde novel was the film's source, with Abe also writing the screenplay. 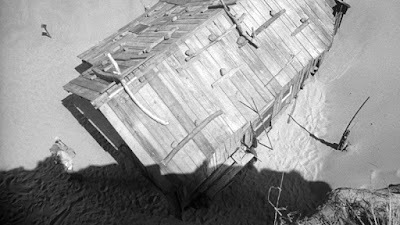 With its stripped-down location (most of the film takes place in or near the hut at the bottom of the pit), its stark black-and-white photography, and its minimalist approach to characterization, the film lends itself to multiple allegorical interpretations and a seemingly inexhaustible supply of graduate theses. Indulge in your favorite take, but don't forget to appreciate the film for its textual and sensual qualities. From the hard slashing opening credits with clanging sounds of city traffic to the first image of a sand grain filmed in unrecognizable close-up to the merciless shots of insects turning helpless circles on the desert floor, “Woman In the Dunes” pulls viewers inexorably into its sweaty, dangerous, desolate world with all the force of the quicksand that threatens to engulf unwary travelers in the film. Toru Takemitsu's unnerving percussive score completes the queasy spell. Sand, flesh, heat, night. Basic elements that add up to an indelible experience that has rattled viewers for more than half a century. The linear PCM mono audio mix really showcases the film's audacious sound design, from the cacophony of traffic and city sounds over the opening credits to the eerie almost-silences of night in the desert. Just as important, Toru Takemitsu's sensational score (an all-time great, surely) is treated very well by this lossless audio. Optional English subtitles support the Japanese audio. 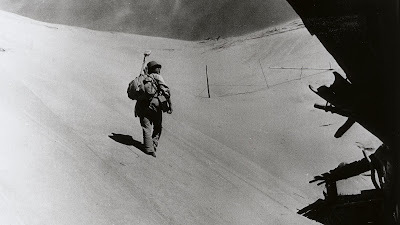 Criterion previously released “Woman In the Dunes” in 2007 on DVD as part of a 3-film Teshigahara boxed set which also included “Pitfall” (1962) and “The Face of Another” (1966). A fourth disc included the majority of the supplements, all of which have been included on this Blu-ray release of “Woman” except for the trailers for the other two films. There are no new features exclusive to this 2016 re-release. A video essay by critic James Quandt (2007, 29 min.) provides Quandt a chance to survey various interpretations of the film and reject several. Quandt's video essays are always top-notch and this one is no exception. A documentary (2006, 35 min.) discusses the collaboration of Teshigahara and novelist/screenwriter Kobo Abe and includes interviews with critics Tadao Sato, Donald Richie, and Richard Pena. The disc also includes four of Teshigahara's short films. “Hakusai” (1953, 23 min.) is a documentary about a well-known wood block artist. “Ikehana” (1956, 32 min.) touches on the subject of a school of flower arranging. “Tokyo 1958” (1958, 24 min.) is an impressionistic city symphony portrait of the title city. “Ako” (1965, 24 min.) is the director's segment of an omnibus film. The thick insert booklet features an essay by film scholar Audie Bock and an interview with Teshigahara conducted by Max Tessier, both of which were included with the insert booklet from the 2007 boxed set.